A family native to this area will be featured on NBC’s Today Show tomorrow (Friday). Turpin natives Chris and Sarah Roberts live in Edmond and are finalists in the NFL’s Together We Make Football contest. Chris graduated from Turpin High School in 1995 and Sarah Riffe graduated from Turpin in 1996. 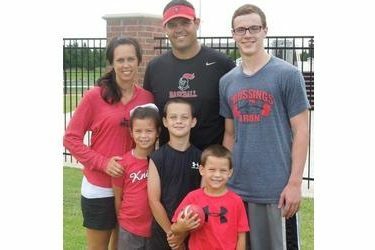 Chris is the head football coach at Crossings Christian School in Edmond and the couple adopted one of his football players after both of the players’ parents passed away. Coach Roberts became a father figure to a player named Christian the past few years. Christian lost his dad to ALS four years ago. In September, Christian lost his mom to immune deficiency disease. Christian asked coach Roberts, Sarah, and their children Cale, Chloe, Case, and Elisha if he could move in with them. The answer was a resounding yes. On the day of Christian’s mom’s funeral, Sarah thought this story should be told. Coach/player become father/son. Sarah made a video of their story and submitted it to the NFL’s "Together We Make Football" contest. She was called several weeks later and told that the NFL would be coming to their home, school, practices, and game to video the Roberts family. After three days of cameras, microphones, and interviews, the video was done and ready to be edited. A week later, the NFL called Crossings Christian School and asked if they would assemble the entire school together on Friday morning because they were coming back to do more video. Deion Sanders came out of the side door and announced to the crowd and to the Roberts family that they were finalists in the NFL’s "Together We Make Football" contest. Three days later the NFL call again and told Sarah they would like to fly Chris, Sarah, and Christian to New York Friday, November 21 to be on the NBC Today Show live, to announce they were one of six finalists. All six videos that made the finals will on on Friday’s show. The winner is picked by a public vote. Go on line to the Together We Make Football site and vote. The winner receives four tickets to the Super Bowl. The Turpin natives are listed as Team Roberts.